Contrary to what many people think, The LDS do believe in salvation by grace. No man is capable of saving himself. If it wasn’t for the saving atonement of Jesus Christ all mankind would be lost. No matter how hard we work, no matter how much we obey, no matter how many good things we do in this life, it would not be enough were it not for Jesus Christ and His loving grace. On our own we cannot earn the kingdom of God no matter what we do. You may have heard something similar before in a conversation with an LDS friend, and you might have left the discussion either confused or convinced you both have the same gospel. Sometimes when challenges in real life come up, you have to do a little digging before you can give an answer. So for this challenge, in addition to your response, we’d like to hear what questions you’d ask to clarify whether or not you agree about the nature of salvation. How would you graciously handle a situation where this came up in conversation? And if you’ve had this conversation before, we’d love to hear how it went. On Brett’s last mission trip to Utah, he interviewed apologist Sandra Tanner of Utah Lighthouse Ministry on this subject, so we’ll be posting that interview as a response on Thursday. What do you mean by “salvation”? What are we being saved from? What does ‘grace’ mean? Do we participate in our salvation at all? Do we contribute anything to our salvation? If Jesus atoned for everybody’s sins, why isn’t everybody saved? With just those questions, the conversation could take on a life of its own. There’s a LOT to talk about. The main idea of the word is divine means of help or strength, given through the bounteous mercy and love of Jesus Christ. I do agree that it is because of the love and mercy of Jesus Christ that he bestows his grace on us. But there is an ambiguity in the first part. I could agree that grace helps us and gives us strength, but is there something we have to do before God will help us and strengthen us, or is grace something God gives us freely through no merit of our own? According to Paul, grace is, by definition, something that cannot be earned or merited in any way. He said, “But if it is by grace, it is no longer on the basis of works, otherwise grace is no longer grace.” Grace is a gift, and a gift is, by definition, something that cannot be earned. It is through the grace of the Lord Jesus, made possible by his atoning sacrifice, that mankind will be raised in immortality, every person receiving his body from the grave in a condition of everlasting life. I do agree that it is through the grace of Jesus, made possible by the atonement, that people will be raised to eternal life. But not all who are raised are raised to “eternal life.” As Daniel 12:2 says, “And many of those who sleep in the dust of the ground will awake, these to everlasting life, but the others to disgrace and everlasting contempt.” “Eternal life,” in this context, does not appear to mean simply living forever since those who will be raised to everlasting contempt will also live forever. It seems, rather, to signify a certain quality of life. And that also seems to be the sense in which the new testament uses the phrase, “eternal life” (cf. Matthew 25:46, John 3:36, Acts 13:48). Being raised to shame and everlasting contempt hardly seems an act of grace in the sense of divine help or mercy. It is likewise through the grace of the Lord that individuals, through faith in the atonement of Jesus Christ and repentance of their sins, receive strength and assistance to do good works that they otherwise would not be able to maintain if left to their own means. I do agree that it is through grace that we receive strength and assistance to do good works that we wouldn’t otherwise be able to do. I do not agree that repentance is a requirement to get such grace. On the contrary, I think the strength and assistance necessary for us to repent also requires grace. It is through grace that we are enabled to repent. Repentance is something that God grants to people (Acts 5:31, Acts 11:18, 2 Timothy 2:25). According to Jesus, we would not even be able to come to him for salvation without the Father enabling us (John 6:44, 65). According to Paul, we were dead in our sins (Ephesians 2:1), but “God, being rich in mercy, because of His great love with which He loved us, even when we were dead in our transgressions, made us alive together]with Christ (by grace you have been saved)” (Ephesians 2:4-5). Since repentance requires the grace of God, it cannot be a condition that must be met before God bestows that grace. If it were, we’d all be doomed. This grace is an enabling power that allows men and women to lay hold on eternal life and exaltation after they have expended their own best efforts. I agree that it is because of grace that we are able to lay hold on eternal life. But I’m not sure what it means by “enabling power.” If it means we are enabled to live a life that is righteous enough to merit eternal life, of course I couldn’t agree with that. Paul explicitly says that works cannot merit eternal life. You can’t undo a wrong by doing a right. James said, “Whoever keeps the whole law and yet stumbles in one point, he has become guilty of all” (James 2:10). A law breaker is a law breaker no matter how good they otherwise are, and they deserve to be punished for that violation. So there’s no way that anybody can merit eternal life by doing good works. I’m sure even a Mormon would agree that nobody lives completely without sin even when God enables us to do good works. I’m not sure what is meant by “after they have expended their own best efforts.” If that means the same thing as “because they have expended their own best efforts,” then again, this would contradict Paul’s understanding of grace in Romans 11:6. According to Paul, none of our efforts can avail us of the grace of God. It is a gift, and a gift, by definition, cannot be earned. Divine grace is needed by every soul in consequence of the fall of Adam and also because of man’s weaknesses and shortcomings. However, grace cannot suffice without total effort on the part of the recipient. Hence the explanation, “It is by grace that we are saved, after all we can do” (2 Ne. 25: 23). Nobody does all they can do. Nobody exerts “total effort.” If this point of view is true, then grace is insufficient to save anybody. Carl, I want you to be honest with yourself about this. Do you exert total effort to do good at all times? Can you honestly say that you have done all that you can do? If you haven’t, then the Mormon gospel cannot save you. But I would like to recommend to you the wonderful and liberating gospel of Jesus Christ that Paul taught. It begins with the unfortunate observation that “there is none righteous, not even one; there is none who understands, there is none who seeks for God; all have turned aside, together they have become useless; there is none who does good, there is not even one” (Romans 3:10-12). We are all dead in sins. But, by the grace of God that he bestows on those he loves, we are rescued from our deadness in sin. We are freed from our slavery to sin. We are enabled to come to Christ for salvation. God saves us completely. In doing so, he glorifies himself. The true gospel leaves no room for boasting on our part. The Mormon gospel leaves plenty of room for boasting. A Mormon can boast that he has, by his own strength, repented of his sins in order to obtain God’s grace. A Mormon that actually has obtained God’s grace ( if it’s even possible to do so under the Mormon system), can boast that he exerted all his effort and tried his hardest. It is truly the grace of Jesus Christ that makes salvation possible. This principle is expressed in Jesus’ parable of the vine and the branches (John 15: 1-11). See also John 1: 12-17; Eph. 2: 8-9; Philip. 4: 13; D&C 93: 11-14. John 15:1-11 says that apart from Jesus, we can do nothing. I would submit that includes repenting, which Mormonism says is necessary to obtain God’s grace. Ephesians 2:8-9 says that salvation by grace through faith is not a result of works, which explicitly negates the Mormon view that we obtain grace through our best efforts. I’m not sure how Philippians 4:13 applies. This passage is about how God appoints offices in the church for the equipping of the saints (see the previous verse). Here are two clarifying questions: The works that I do, do they aid in my obtaining salvation, or is the work of Jesus sufficient for my salvation? 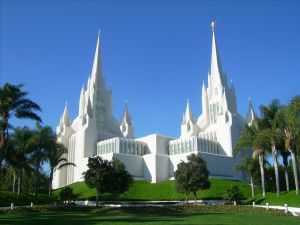 Depending on the answer given, you can ask them whether the works done in the LDS Temple are required for salvation? One question… Are you sure their website wasn’t hacked and changed? I think the others have commented well on this one. I really have nothing to add.